This document provides a brief summary of the CO2 global warming issue – and shows why the theory is wrong. Global Temperatures have generally increased over the last century (except for the last 10 years) – as has the atmospheric CO2. The United Nations based Intergovernmental Panel on Climate Change (IPCC) has become the definitive authority on the promotion of the anthropogenic CO2 as the cause of the warming and of the justification of scare stories of what the future may bring. The following shows the Hadley Climatic Research Unit global average temperature anomalies (the IPCC uses data provided by HadCRU – plot from: [http://hadobs.metoffice.com/hadcrut3/diagnostics/global/nh+sh/]). The global average temperature has increased about 0.8 degrees C in the last 100 years. There is no empirical evidence that anthropogenic CO2 has caused the observed global warming trend – the only evidence comes from the in the computerized climate models based on the assumptions incorporated in the models. 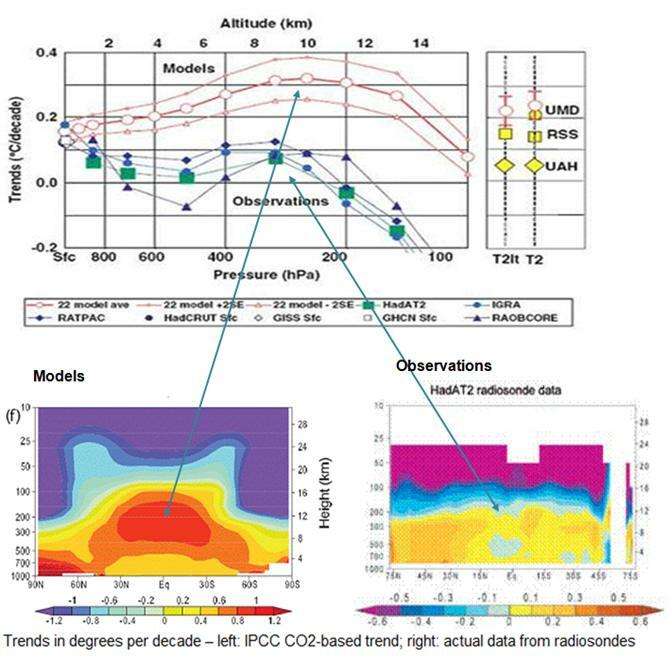 The following figure superimposes the above HadCRU temperature anomalies on the IPCC graph of model outputs. (IPCC 2007 AR4 Figure SPM-4 [http://www.ipcc.ch/pdf/assessment-report/ar4/syr/ar4_syr_spm.pdf]) In this figure, the blue shaded bands show the result of 19 simulations from 5 climate models using only the natural forcings. Red shaded bands show the result of 58 simulations from 14 climate models including anthropogenic CO2. This clearly shows that prior to about 1972, the global warming is fully explained by climate models using only natural forcings (i.e. no human CO2). The models need input of CO2 only after about 1970 – prior to 1970 all warming was natural, according to the IPCC. There is no empirical evidence relating CO2 to the post-1970 warming as a causative factor – only the fact that the computer models require CO2 to produce warming. The media stories often report temperature increases over the last century and attribute it to anthropogenic (human caused) CO2 based global warming – but the models indicate that anthropogenic CO2 has only caused warming since the early 1970s. Even though the IPCC released this figure in 2007, it only shows temperatures up to the year 2000 – likely due to the fact that there has been cooling since then (although atmospheric CO2 has continued to increase). Email exchange between: Michael Mann, Edward Cook and Tom Crowley, May 2, 2001, (Subject: “Hockey Stick” [http://www.eastangliaemails.com/emails.php?eid=172&filename=963233839.txt]). 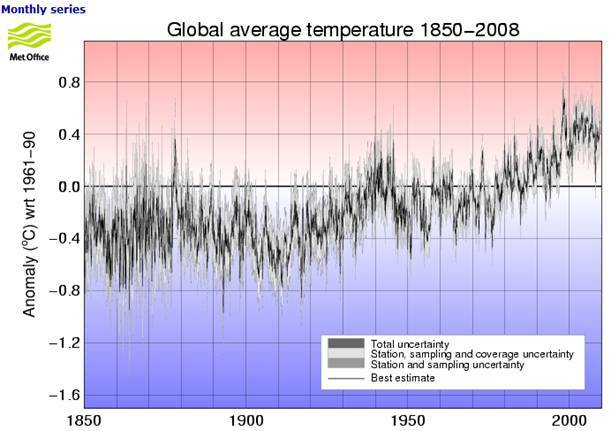 The following figures show the global temperature anomalies from the Hadley figure shown previously. 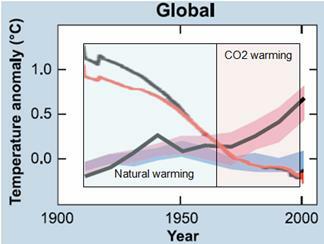 Two cycles have been highlighted in rectangles: the “natural” cycle (1880-1946: green) and the “CO2-caused” cycle (1942-2008: red), according to the IPCC. The final part of the figure shows the 1942-2008 cycle changed to red and overlaid on the 1880-1946 cycle (vertically shifted by 0.3 degrees). 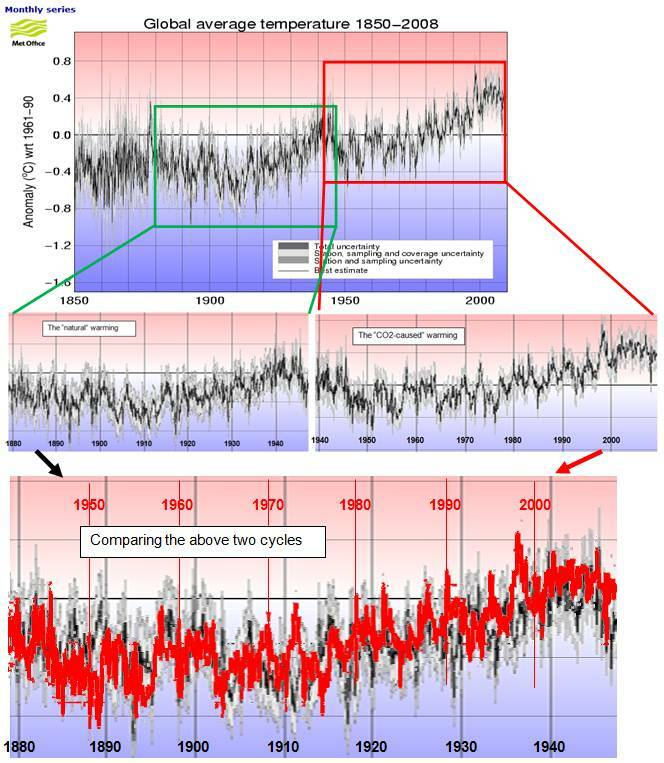 As can be seen from the above figures, the two cycles were nearly identical, and yet the IPCC says the models can explain the early 1900s cycle with only natural forcings, but anthropogenic CO2 is needed for the later cycle. There appears to be a serious problem with the models when two identical cycles have two very different causes. The following figure shows global average temperature from five data sets since the start of the satellite temperature data era in 1979 (RSS MSU and UAH MSU are satellite data, HadCRUT3, NCDC and GISS are surface station data sets – graph from http://climate4you.com/GlobalTemperatures.htm). From 1979 to 1997 there was no warming trend. 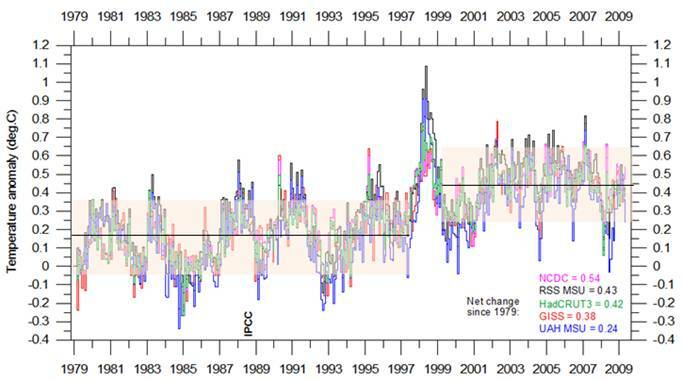 The major El Nino then resulted in a residual warming of about 0.3 degrees. Since the 1998 end of the El Nino there has also been no warming trend – all of the warming in the last 30 years occurred in a single year. And yet this is the era that the IPCC says the warming is caused by CO2 – and alarmists are still saying that it’s getting worse, etc. Global warming is not global. 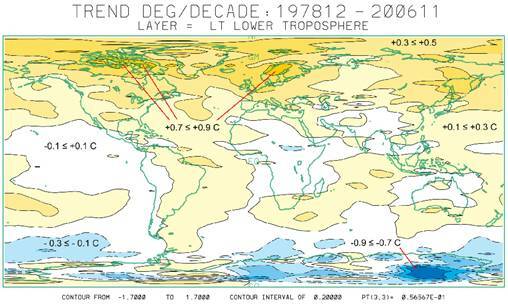 The following figure shows the global temperature change from 1978 to 2006 for the lower troposphere from UAH satellite data [http://climate.uah.edu/25yearbig.jpg]. The warming is a northern hemisphere phenomenon – particularly in the Arctic. The following figure shows a more recent satellite data trend from the RSS analysis 1979 - 2008 [http://www.ssmi.com/msu/msu_data_description.html]. The left-hand figure shows regional warming around the world, the right-hand figure shows the average warming by latitude – zero warming at 60 degrees S with increasing warming into the Arctic. This illustrates that recent warming is a northern hemisphere phenomenon. The following figure compares the Arctic temperature trends with global temperature trends. [http://www.frontier.iarc.uaf.edu/~igor/research/aw/index.php] Two observations are evident from this graph: the recent Arctic warming is not unprecedented, and the Arctic warming is much greater than the global warming. The following figure is from the IPCC Fourth Assessment Report (AR4) Figure 9.6 (2007). It shows the change in temperature (C per decade) by latitude. The black line shows the observed temperature, the blue band shows the output of the computer models including only natural factors, whereas the pink band shows the output of computer models including anthropogenic CO2. Notice that the models without CO2 (blue shaded area) can explain all of the warming for most of the world up to 30 degrees north latitude. This figure also shows cooling in Antarctica with warming increasing in the Arctic. The following figure shows the average lower troposphere temperature (near the Earth’s surface) from satellite data, for the northern hemisphere (north of 20N), tropics (20N – 20S) and southern hemisphere (south of 20S) (figure adapted from http://climate4you.com/). The northern hemisphere has warmed about 0.5 degrees C, while the southern hemisphere has warmed about 0.1 C and the tropics show no net warming over the 30 years of available satellite data. See http://www.appinsys.com/GlobalWarming/GW_NotGlobal.htm for more details on the non-global issue. 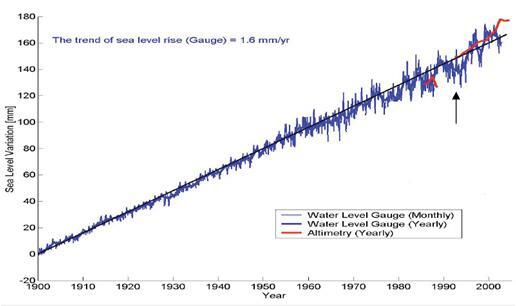 The IPCC stated in the Third Assessment Report (2001) [http://www.grida.no/climate/ipcc_tar/wg1/425.htm]: “There is no evidence for any acceleration of sea level rise in data from the 20th century data”. The following figure shows cumulative sea level change for 1900 to 2002. 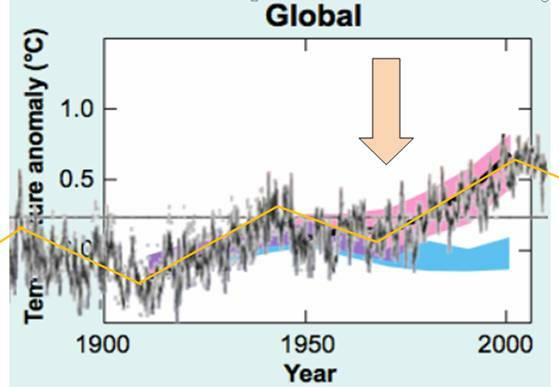 The trend shows no increase in rate since measurements began [http://www.wamis.org/agm/meetings/rsama08/S304-Shum_Global_Sea_Level_Rise.pdf]. Since according to the IPCC, CO2-based warming is only evident since the 1970s, all of this sea level rise since prior to 1970 cannot be caused by anthropogenic CO2, and yet the trend has not increased. Thus sea level rise cannot be attributed to CO2. Alarmists say everything is accelerating and it’s worse than expected. But they carefully select start and end dates to create exaggeration. The following figure shows sea level from 1993 to 2009 [http://sealevel.colorado.edu/]. This figure shows a rate of 3.2 mm/year since it starts at a low point in the fluctuating data (the 1993 start indicated by the arrow in the above figure). But the last 6 years exhibit a much lower rate of increase. See http://www.appinsys.com/GlobalWarming/GW_4CE_SeaLevel.htm for more details on sea level change. The same trend is true of glaciers around the world – they have been receding since record keeping began. The following figure shows the composite average of up to 169 glaciers (the number varies in different time periods) since 1700 (Oerlermans,2005 [http://www.searchanddiscovery.net/documents/2008/08068cuffey/cuffey.pdf]), and right – the same curves superimposed on the IPCC graph of model outputs shown previously. Glaciers have been receding since the Little Ice Age and cannot be attributed to CO2. If anything the rate of global glacier recession since 1970 has declined. See http://www.appinsys.com/GlobalWarming/GW_4CE_Glaciers.htm for more details on glaciers around the world. Lower Right: actual data from radiosonde data, from [http://www.climatescience.gov/Library/sap/sap1-1/finalreport/sap1-1-final-chap5.pdf] showing the actual temperature signature. This further evidence indicates that CO2 is not causing the warming and that there are problems with the models. and http://www.appinsys.com/GlobalWarming/WaterVapor.htm for more details on problems with climate models. In 1988 NASA’s climate alarmist James Hansen provided temperature predictions based on climate models (the results of which he presented to the US congress to promote the scare). He modeled three scenarios: A had an increasing rate of CO2 emissions, B had constant rate of CO2 emissions, whereas scenario C had reduced CO2 emissions rate from 1988 levels into the future. The following figure compares Hansen’s 1988 predictions with actual temperature data since then. 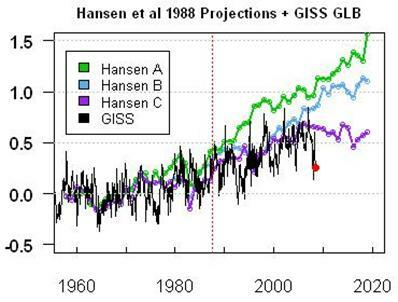 It compares the NASA GISS global data (as compiled by Hansen) with his model projections. (Figure from [http://www.climateaudit.org/?p=3354]). 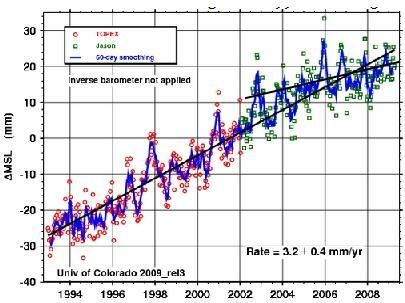 While actual atmospheric CO2 levels have increased since 1988, the fact that actual temperatures are similar to the reduced CO2 models implies a problem with the models – the temperature increase is not due to CO2. See: http://www.appinsys.com/GlobalWarming/GW_TemperatureProjections.htm for more details on Hansen’s prediction scenarios. The scientific method involves making observations (the earth has been warming), forming a hypothesis (it is caused by anthropogenic CO2), testing the hypothesis through further observations and rejecting (or accepting) or revising the hypothesis. Alarmists say that the recent warming must be due to anthropogenic CO2 since we don’t know what else it could be. But that is not a scientific view – an alternative causal explanation is not required in order to reject a hypothesis. And the scientific evidence does not support the CO2 hypothesis. The IPCC (AR4) report (The Physical Basis of Climate Change, 2007 [http://ipcc-wg1.ucar.edu/wg1/wg1-report.html]) states that: “The direct RF [radiative forcing] due to increase in solar irradiance is reduced from the TAR [Third Assessment Report]”. In addition the 4AR states: “There is more uncertainty regarding the influence of solar forcing. In addition to substantial uncertainty in the timing and amplitude of solar variations on time scales of several decades to centuries, which has increased since the TAR although the estimate of solar forcing has been revised downwards”. The problem is that it is not currently understood how the sun can influence the earth’s climate. The IPCC says variation in solar irradiance is too small to have an effect – but the sun’s influence is not just solar irradiance. See also: http://www.appinsys.com/GlobalWarming/GW_Part6_SolarEvidence.htm for more details on solar influences on climate. The principal investigator for the Mars Orbiter Camera said: “The images, documenting changes from 1999 to 2005, suggest the climate on Mars is presently warmer, and perhaps getting warmer still, than it was several decades or centuries ago” [http://www.abc.net.au/science/news/stories/2005/1464931.htm]. William Feldman of the Los Alamos National Laboratory (who is involved with NASA's Mars Odyssey orbiter) says: “One explanation could be that Mars is just coming out of an ice age” [http://www.space.com/scienceastronomy/mars_ice-age_031208.html]. There’s no anthropogenic CO2 on Mars. But both Earth and Mars are coming out of ice ages. I wonder what causes those. In the late 1800s, the “scientific” consensus was that ice ages did not exist. The current “consensus” is that the sun couldn’t be causing the warming because the mechanism is not understood. 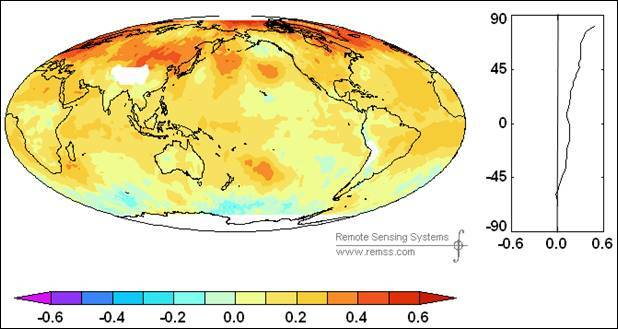 Joseph D’Aleo has conducted a correlation analysis between the Pacific Decadal Oscillation (PDO), Atlantic Multidecadal Oscillation (AMO), CO2 and temperatures [http://icecap.us/images/uploads/US_Temperatures_and_Climate_Factors_since_1895.pdf] and [http://intellicast.com/Community/Content.aspx?a=127]. 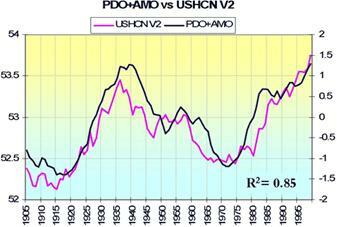 The following figures compare the PDO+AMO with the US average annual temperatures (left) and CO2 with US temperatures (right). The oceanic oscillations provide a much stronger correlation with temperature than CO2 does. The following figure compares the average annual temperature in Greenland with the AMO (no correlation to CO2). Since the scientific evidence doesn’t support the CO2 based theory of global warming, why is it being so overwhelmingly promoted by various groups? 1. Power: The alarm was initiated at the United Nations in the 1980s.The original goal was to use it to achieve global governance and fund it through a global carbon tax. Maurice Strong Secretary General of the UN Earth Summit said it would play an important role in "reforming and strengthening the United Nations as the centerpiece of the emerging system of democratic global governance." France’s former President Jaques Chirac called Kyoto "the first component of an authentic global governance." See www.appinsys.com/GlobalWarming/GW_History.htm for details on the development of the global warming scare and original sources for the above quotes. 2. Money: The biggest promoters of the global warming scare are also those benefiting the most monetarily. Climate Change Capital (CCC), whose slogan is 'Creating Wealth Worth Having®', is another carbon trading company, with $1.6 billion under management. They state: “All energy markets are created by policy… Our ability to advise on and execute financial transactions in carbon constrained markets gives us a clear advantage”. It’s easy to see where their advantage comes from. CCC’s Executive Director and Vice Chairman, James Cameron, “spent much of his legal career working on climate change matters, including negotiating the UNFCCC and Kyoto Protocol” and is a member of the board of GE Ecomagination and a member of the Copenhagen Climate Council. His first work on global warming was a 1988 commission from Greenpeace, to advise whether the International Court of Justice could be used to bring a claim against the US for its failure to deal with climate change. Cameron and Maurice Strong were both on the 2000-2001 advisory council of the International Institute for Sustainable Development. See http://www.appinsys.com/GlobalWarming/CarbonMonetization.htm for details on the monetization of the global warming scare and original sources for the above quotes. The United States’ refusal to go along with Kyoto weakened the UN’s plans for a global government. Thus the UN now views the issue more as a means of transferring wealth to Africa and to fund the Millennium Development Goals. See: http://www.appinsys.com/GlobalWarming/HumanImpact.htm#forum for more details on the MDGs and the UN’s scam. 3. Ideology: The global warming scam is being used as an excuse to promote “social justice” – the developed countries emit fossil-fuel based CO2 and should pay the “developing” countries money. The former Canadian Environment Minister Christine Stewart stated: "No matter if the science is all phony, there are collateral environmental benefits…. climate change [provides] the greatest chance to bring about justice and equality in the world." In July 2008 the Government of India published a National Action Plan on Climate Change [http://pmindia.nic.in/Pg01-52.pdf]. Section 1.4 of the Technical Document states: "No firm link between the documented [climate] changes described below and warming due to anthropogenic climate change has yet been established." India is taking a pragmatic approach and has no intention of cutting CO2 emissions if it affects its economic growth. The report Overview states: "India is determined that its per capita greenhouse gas emissions will at no point exceed that of developed countries even as we pursue our development objectives." The following figure shows global greenhouse gas emissions (GHG) by type from the 2007 IPCC AR4 SPM [http://www.ipcc.ch/pdf/assessment-report/ar4/syr/ar4_syr_spm.pdf]. Note that CO2 fossil fuel use is 56.6 % of GHG globally. In 2004 the United States produced about 22 % of the global fossil fuel based CO2 emissions [http://www.eia.doe.gov/bookshelf/brochures/greenhouse/Chapter1.htm]. Thus, even if the United States eliminated all automobiles and all fossil fuel based electricity generation, etc – global GHG would be reduced by only 12 %. This massive change would have close to zero effect even if the CO2-theory were true.